Lavender Quartz is a powerful energy that is unlike any other. Think of the Violet Flame, the all consuming flame of unconditional Divine Love and freedom from the past perceived imperfections combined with the nurturing, all embracing, compassionate love of Quan Yin. This energy not only fills our emotional body but allows us to reach out and share in compassionate and loving actions towards others. At the core of our being, we only want to be loved. And yet, the true essence of who we are (Divine spark, Divine Source), in spirit, IS unconditional love. We ARE what we seek! Isn't that a hoot? We spend years, lifetimes even, seeking and searching for that which we already are. It is like looking for our glasses only to find, hours later, that they have been on top of our head all along! Lavender Quartz opens a direct connection to your inner child. Often the hurts we experience come from the earliest of years. These parts may be hiding or repressed due to trauma, childhood programs, conditioning by family and society (who were directly conditioned by their family and society, who were directly conditioned by THEIR family and society. It is a cycle, is it not?). Lavender Quartz helps to locate that young part of yourself, to embrace them, to tell them they are safe, to accept them as a very important part of the whole that is you. This is the beginning of healing. Lack of self worth and self love are often due to these earlier issues and experiences. Where you may have, in the past, withdrawn, it is now time to call upon that child and embrace them. Begin healing their wounds, that are in truth, your wounds. Lavender Quartz is a stone of forgiveness. It will help you to work through issues, and forgive those involved so that you can begin the process of repairing and releasing the damage. How deeply you choose to forgive is up to you. The forgiveness is strictly so that you can move past the experience, not be held hostage by it. Lavender Quartz helps us to change our perspective. Lavender Quartz helps to heal emotional wounds. It removes the label of victim and in its place a new perception is granted--one of survivor, super hero, self empowered god/goddess. The title is yours for the taking. Own it! Lavender Quartz has a gentle pulsing of energy, a nurturing presence, supportive, caring and compassionate. I am shown a pale lavender pink light emanating from the stone itself that grows in size and intensity. It penetrates the heart space, filling the space, and eventually the entire body, with this loving light. Lavender Quartz has been made available at this time for those who are ready to do the work. It may not be easy. But it is time. 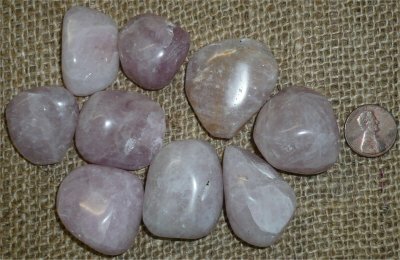 From MetaphysicalRealm1.com - Lavender Quartz Crystal is Rose Quartz with added minerals to turn it lavender. It is quite rare, and I was thrilled to find these pieces from Peru. I have been waiting for these crystals for quite some time. Lavender Quartz does, of course, work on the Third Eye Chakra, helping you develop your ability to see, feel, and hear the messages that are sent to you from various sources. This crystal is also good at helping you apply these talents to your physical world. Lavender Quartz is excellent at connecting your Crown Chakra to what I call the Soul Chakra which is above our heads. The metaphysical properties of Rose Quartz also apply.